Spotify, the popular music streaming service available only in select European countries, introduced on Monday a mobile application for the Symbian operating system, which includes Nokia, Sony Ericsson, and Samsung phones. European owners of various Nokia phones, such as the N97, E72 or XpressMusic, can now download the Spotify app and enjoy music streamed to their phones. Several other phones will be able to run this app, including the Sony Ericsson Satio and Samsung Omnia HD (i8910). A full list of supported devices can be found here. 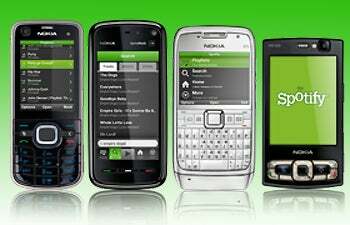 On the par with the iPhone and Android Spotify apps, Symbian users will have to pay the equivalent of $16 per month to access the mobile service, though the mobile application is free to download. Songs can be downloaded on the handset for offline listening when out of network coverage. The Spotify desktop software (PC&Mac) works on a freemium model, and nonpaying subscribers have to listen to audio ads occasionally between songs. Paying the monthly subscription gives you access to mobile streaming and advertising-free music. With iPhone, Android, and Symbian Spotify apps now available, the only major smartphone platforms not to have a Spotify app are Windows Mobile and BlackBerry OS. While in the U.K. you can buy a HTC Hero with Spotify preinstalled and prepaid for the lifetime of your contract (two years minimum), a viable U.S. (streaming) alternative would be the Rhapsody (for iPhone) service, which similarly charges $15 per month. Direct-to-device music streaming is speculated to be the future of music industry, rather than the now-traditional model of the iTunes Music Store. But so far, this model is yet to expand in popularity, as slow wireless connections or the occasional lack of a connection can leave you stranded without music if you haven't cached your songs before leaving home.